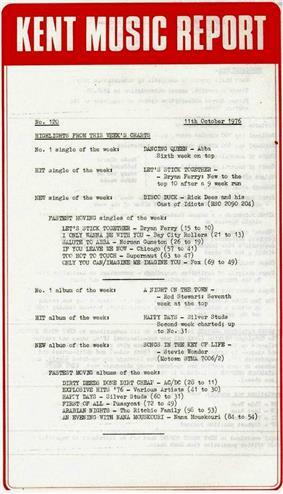 The Kent Music Report was a weekly record chart of Australian music singles and albums which was compiled by music enthusiast David Kent from May 1974 through to 1998. After 1988, the Australian Recording Industry Association, who had been using the report under license for a number of years, chose to produce their own charts as the 'ARIA Charts'. Prior to the Kent Report, Go-Set magazine published weekly Top-40 Singles from 1966 and Album charts from 1970 until the magazine's demise in August 1974. David Kent later publicised the Australian charts from 1940–1973 in a retrospective fashion using state by state chart data obtained from various Australian radio stations. Kent had spent a number of years previously working in the music industry at both EMI and Phonogram records and had developed the report initially as a hobby. The 'Kent Music Report' was first released on a commercial basis in July 1974 and was offered for subscription. The report data was initially based solely on radio station charts from around the country, which were then amalgamated using a points based ranking system that Kent had developed. These radio station charts were compiled primarily using data collected from local record stores and, as such, were based primarily on retail sales (i.e. they were not airplay charts). In 1976, as funding from subscriptions grew, Kent himself started collecting sales data from retail stores to supplement the radio station charts (which were also based on sales data). His operation grew and staff were employed to assist with research. Within a year or so, the major record companies started using the Report for their own marketing programs and it had established itself as the leading national chart publication. From 1982, retail sales data collected by Kent and his staff were used exclusively and radio station charts were dropped from the primary tabulations. Some radio station chart data was used as supplementary information, however. At about the same time, the Australian Recording Industry Association was established by the major record companies, being EMI, Festival Records, CBS (now known as Sony Music), RCA (now known as BMG), WEA (now known as Warner Music) and Polygram (now known as Universal). From 1983 until 1988 ARIA had a licensing arrangement with Kent to use the Report under their own banner. The Kent Report continued however and in 1987 was rebadged as the 'Australian Music Report' (AMR). In 1988 the arrangement with ARIA ended and the ARIA Charts were produced in-house by the Association. In April 1998, The AMR charts ceased publishing, leaving the ARIA charts as the only nationally recognised chart publication. In 1993, David Kent published his Australian Chart Book 1970 - 1992. This was based on his chart data already published as the "Kent Music Report" from May 1974 onwards. He specially "retro-calculated" charts based on state-based Australian radio station charts available to him dated prior to May 1974, to fill in the missing years (1970-1974). On this basis, he also put together Australian national charts from 1940 - 1969, published as Australian Chart Book 1940 - 1969 in 2005. Prior to 1949, radio station music charts in Australia were only available on a monthly basis, and this is reflected in his published data. Although ARIA published the official Australian National charts from 1988 onwards, Kent continued to calculate charts from this date, data from which were published in a third book in his Australian Chart Book series. ^ Daniel Lowe. "Australian Chart History". Archived from the original on 2008-04-04. David Kent (2005). Australian Chart Book 1940 - 1969. Australian Chart Book Pty Ltd, Turramurra, N.S.W. ISBN 0-646-44439-5. David Kent (2006). Australian Chart Book 1993 - 2005. Australian Chart Book Pty Ltd, Turramurra, N.S.W. ISBN 0-646-45889-2.